Look at the portraits in Rory Lewis's exhibition and a wizard, a space captain, a general, a stripping steelworker and an Olympian stare back at you. They seem like a disparate group, but what they have in common is that they all come from the North of England. Rory Lewis's Northerners features a plethora of famous and less well-known faces, including - as you may have guessed - Sir Ian McKellen, actor Paul Barber, gymnast Beth Tweddle, Sir Patrick Stewart and the Army's Chief of the Defence Staff, General Sir Nicholas Houghton. It is a formidable list and one which most studio photographers can only dream of shooting for one show. Lewis - who spends most days photographing actors for headshots and models for portfolios - admits that, in the beginning, he would have counted himself in that dreaming group. However, when he hit upon the idea for a show celebrating the North's finest, he decided he was not going to settle for second best. "Right from the outset I felt I should aim for the top - rather than just photographing the local WAGs and mayors, I wanted to aim higher. "I wanted Patrick Stewart, Ian McKellen, Dame Judi Dench and John Hurt." To that end, he began writing "hundreds of letters, letters upon letters" asking people to take part in the show and telling them it would be held in aid of children's charity Unicef, in the hope of giving them "an extra incentive to spare some time". His breakthrough came when "one of the UK's most celebrated actors", Manchester-born David Warner, agreed to take part after "three emails, four letters and a great deal of perseverance". "I had done my research and discovered that David was attending a convention in London, [so] I arranged for my letter to be placed directly in David's hand. "After a week of waiting, David emailed me accepting my invitation. I was over the moon." He says the shoot ended up being "hugely memorable" and "opened a lot of doors for me", though it was a nerve-wracking experience. "David revealed that he had an aversion to having his picture taken and that he hadn't sat for a professional studio photo shoot since 1966. "The last photographer he had worked with was Cecil Beaton, and prior to that Lord Snowdon and David Bailey. "I took a big gulp and felt the pressure flow down my throat: those were big names to follow." He said after offering "a little direction, David took over with some remarkable expressions" and he ended up with a portrait he was "really pleased with". He had a right to be - the portrait has since been accepted by the National Portrait Gallery for their permanent collection, giving what Lewis says is "a historic dimension" to the work. Following that shoot, more positive responses arrived, which meant Lewis travelling away from his Liverpool and Manchester studios to get his shots. 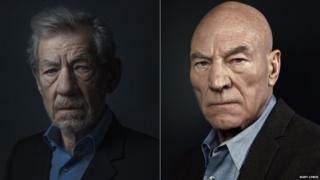 Two of the biggest names on his list were Sir Patrick Stewart, who was born in Mirfield, West Yorkshire, and Sir Ian McKellen, who grew up in the coal-mining town of Wigan. "Many of these big names started in the North but now live across the globe. "When I wrote to Sir Patrick and Sir Ian, they were at the Cort Theatre in New York performing Waiting for Godot. "They initially replied saying they had little time to spare. "I sent a reply mentioning it wouldn't take long and that it would mean a great deal - after a few letters, they finally came round and said yes and I flew to New York to take the shots." Not every face in the exhibition is a famous one - included are the likes of Liverpool mayor Joe Anderson and the city's Philharmonic Orchestra conductor Vasily Patrenko - but Lewis says it was important to get a mix. "I wanted to show all those people who make up the fabric of the North - that includes those involved in the day-to-day running of government and those who represent the North of England." Putting Gandalf the Grey alongside the Lord Mayor of Liverpool and Captain Jean-Luc Picard next to a Manchester councillor, he has certainly shown just how rich and varied that fabric is. Northerners is on show at Calumet Photography in Manchester from 21 October to 21 November and at Calumet Photographic in London from 24 November to 2 January.